Luxurious newly constructed view home in prestigious Point Grey - North of Fourth. 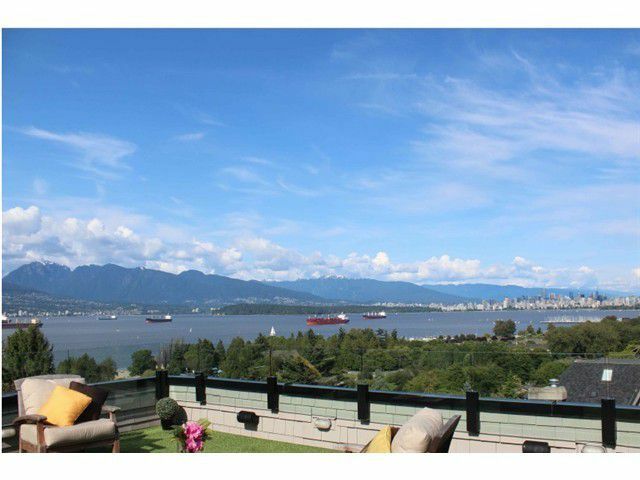 Water, mountain & city views from this very bright and spacious open plan 5 bdrm (3 up/2 down), 4 baths, plus den and flex room (could be 6th bdrm, gym, study). High ceilings and high end finishngs throughout, limestone flooring on main. Huge rooftop deck w/gas firepit and expansive views. Gourmet kitchen features 48" dual Wolf Range w/6 burners and griddle and high capacity Wolf hoodfan, Subzero fridge, walnut cabinets and Caesarstone counters. This great family home has 11 zones in floor radiant heat, air conditioning, HVAC, Control 4 sound system. Master suite features electric blinds, and spa w/steam shower. Fabulous laundry off kitchen features integrated Asko washer/dryer. 2 car garage. New Home Warranty. Two blocks to beach, walk to West Point Grey Academy, bike to UBC, stroll 10th Ave shops, soak up the sun w/amazing views from your great rooftop deck.